The DiMarzio Area pickups take their names from the historical variation seen in Fender single coil pickups from the 1950s and 1960s. The Area 58 (model DP415) is based on the late 50’s stratocaster pickups that were bright and clean. The Area 61 (DP416) is early to mid 60’s (pre-CBS) were thicker sounding and louder that their late 50’s counterparts. The Area 67 (DP419) is based on the CBS-era late 60’s pickups that were brighter and lower output than even the late 50’s pickups. Looking at DiMarzio’s Treble-Mid-Bass ratings, the Area single coils are three of the brightest pickups that DiMarzio make. If you want a warmer single coil sound, perhaps look elsewhere, e.g. the DiMarzio Virtual Vintage pickups. The Treble-Mid-Bass rating is of course only a loose indication and doesn’t tell us how a pickup sounds in real use, as we shall see. The differences between these pickups are not dramatic; a little extra treble here, a little more bass there, and there are differences in the mid range focus. Having tried to record them all in the neck position of the guitar, I was disappointed that the differences in the recordings were not as clear and obvious as I remembered them to be. (Looking at many YouTube pickup comparisons, this maybe a common problem). Recording the same few chords and lead licks just doesn’t give us enough information and so I’m not going to publish those audio recordings. We need to play and feel/hear how the pickups interact with our playing and rig. That in mind, this review tries to describe those subjective differences. DiMarzio went with AlNiCo 2 magnets for the Area pickups which reduces the string pull so you can get them closer to the strings with no ‘stratitis’. That allows a greater range of volume and tone by changing the pickup heights than possible with AlNiCo 5 magnets. The pickups react nicely to changes in height and bass/treble balance can be nicely controlled this way. Indeed, getting that balance right is vital to getting the best sound out of any pickups (something I didn’t do when recording). Note: the following comparisons are of each pickup in the neck position only (because, as I mention below, the middle pickup on my guitar is never used alone, only in combination with the neck and bridge pickups). The Area 61 is the highest output of the three and was the first one I tried. DiMarzio use the terms “steely and woody” and I won’t disagree. This is a brighter pickup than I expected with a thick low end. As a result the mids feel relaxed. It has a great bite on the top end that snaps and snarls when you play hard and responds nicely to aggressive playing. This is not a very high output pickup but it sounds big and can balance well with a low output humbucker. With overdrive the steely top end and bite remains present, avoiding a muddy sound and keeping the essential single coil character, even with a lot of distortion, and I loved that! The Area 58 delivers a classic, lower output single coil sound. It does not have the Area 61’s thick bass or quite the same level of steely overbite, which I feel makes the Area 58 feel the most mid-range focused of the three. In particular the Area 58 has a slightly forward upper mid presence that helps give it a unique clarity and chime. But I wouldn’t describe this pickup as “thin” or “soft” and the notes have a solidity that is very pleasing. I find it interesting that the DiMarzio Treble-Mid-Bass rating suggests the Area 58 has more treble and less mid than the 61 when I find the opposite. Perhaps we disagree on where treble starts and mid range ends! In any case, the Area 58 manages to feel a little brighter than the Area 61 but without significant extra treble, which is a pretty neat trick. The Area 58 is a little smoother sounding with overdrive or distortion than the ’61 but can still deliver single coil bite and sizzle, particularly when you play hard and/or have the pickup close to the strings. The Area 67 is a slightly lower output than the Area 58 and a little brighter too. This is possibly the brightest pickup DiMarzio make, at least in theory though. I didn’t find it thin or shrill with my amp setup and it’s really only a hair brighter than the Area 58. I thought the Area 67 was a very sweet, “hi-fi”-sounding pickup. Again contrary to what DiMarzio’s T-M-B numbers suggest I felt the Area 67 had a little more low frequency response than the Area 58, which balanced well with the 67’s extra highs. I loved this pickup, and initially preferred it to the Area 58, though I though its lower output against my bridge humbucker could be a disadvantage. I found all these pickups to be very dynamic and reactive to changes in pick attack and volume. You play, they follow and the sounds jump out your amp. The Area 61, perhaps by virtue of the higher output coupled with my amp settings, felt more ‘compressed’ than the Area 58 or 67, but in a really nice way. It’s still a dynamic pickup though, biting beautifully when you dig in on single notes. In fact, I played more aggressively with this pickup because that bite is just so much fun. After a day of testing, the Area 61 was my initial choice for my neck position pickup. For the next few weeks I loved it! 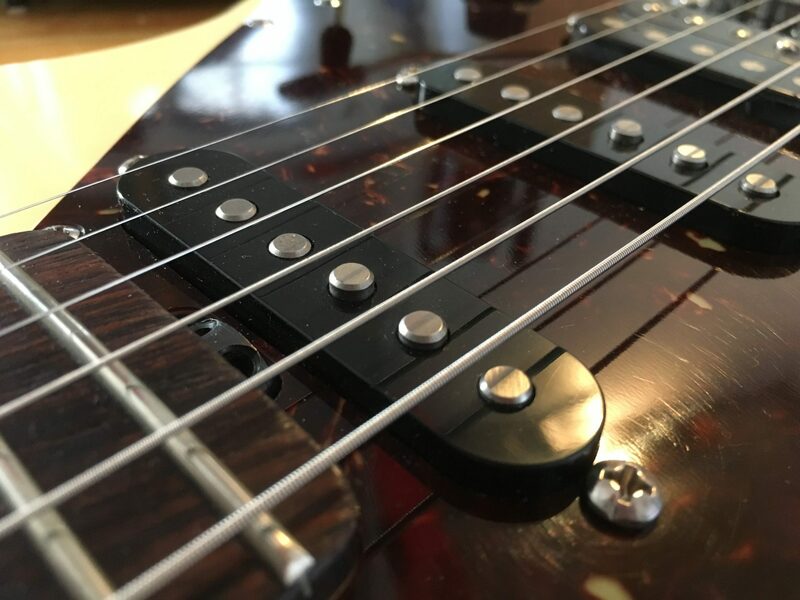 However, after a month with the Area 61, as much as I wanted to love this pickup I realised that the lows were just a little too thick and the steely bite in the highs imposed itself too much on my playing style. So I switched the Area 61 for the Area 58, which as I said above, has a somewhat smoother, more mid focused sound. The more time I spend with the Area 58 as my neck pickup, the more pleased I am at just how versatile and classy it is. I am constantly struck by how good it sounds. It’s a very strong performer that can manage a snarl or be very polite as required. In fact I’d go as far as to say that the Area 58 is one of the best sounding pickups I have ever used. That it took so many weeks with the Area 61 for me to figure that out about the 58 is a valuable lesson: we should give new things more time to prove themselves before making final decisions! I have a custom wiring on my Music Man Silhouette Special where the middle position of the 5-way switch is not the middle single coil on its own but the neck single coil + full bridge humbucker (which is a DiMarzio Virtual PAF). The Area 58’s mid range brings a little extra creamyness to this combination that other single coils didn’t, and I like it! It’s slightly more reminiscent of two humbuckers in parallel than the brighter and snappier telecaster middle position sound. With the Area 58 in the neck position, the Area 67 is my current middle pickup choice. It’s extra brightness helps to keep the bridge/middle position (which for me is a full humbucker bridge) bright and snappier than the Area 58 does. In use, the volume difference between the 58 and 67 is so slight that it’s almost non-existent. Provided you don’t mind setting a bridge humbucker a little lower than you are used to visually, the area singles won’t be overpowered by a PAF-type humbucker. Visually I don’t like staggered pole-pieces but the string-to-string balance on all of these pickups is excellent. So much so that I adjusted the screw pole pieces on my humbucker to match! Does it really make that much of a difference? Maybe not, but I am happier! Many people say that noise-free single coil-sized pickups can’t sound as good as “true” single coils. I disagree! I can assure you that these Area pickups all sound just as real as any single coil pickup I’ve ever used. Of course there is a wide range of single coil sounds, no one sound is definitive, and these do have their own character. Everyone’s ears have preferences with their guitar/playing/style/rig, so maybe these won’t work for you, oir maybe they will! With any pickup you really have to spend some time with your guitar and your rig and dial in the optimum pickup height, particularly the low E to high E string balance. But once you do, these pickups do everything you want a good single coil to do, all the clarity and quack and cluck and squank, and yet they truly are humbucker quiet. If you can manage not to let your preconceptions overpower your ears (i.e. ignore some of the biased negative reviews on the internet) even the most skeptical among you will be surprised at just how good these noiseless single coils are. They’ve got it all going on.